This is lofty, light and peaceful room built in 1835. It has 100 chairs which can be moved easily to suit the event, plus benches to seat an additional 80. It opens off the spacious foyer with easy chairs. There is a hearing loop. Typical uses include faith groups, public meetings, large education classes and groups. 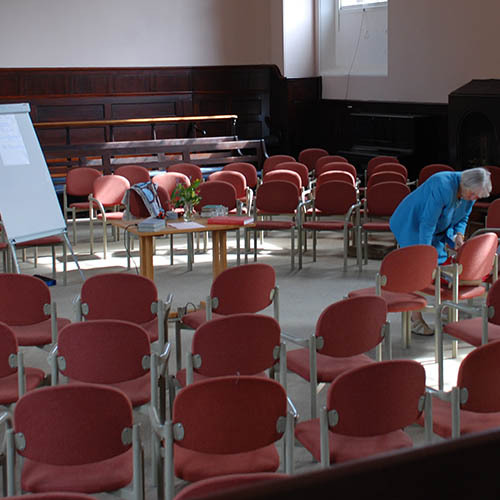 This room has chairs for up to 50 people which can be arranged in different layouts, and has eight large folding tables. It opens off the spacious foyer with easy chairs. There is a serving hatch to the large kitchen. Typical uses include courses, seminars and presentations. This room seats 15 around a central table which can be split into sections. There is an adjacent kitchenette for making hot drinks. 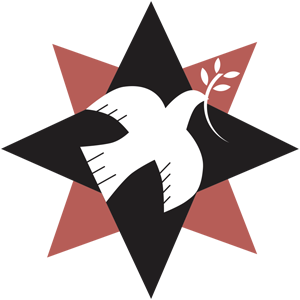 Typical uses include discussion and meditation groups, and large committee meetings. 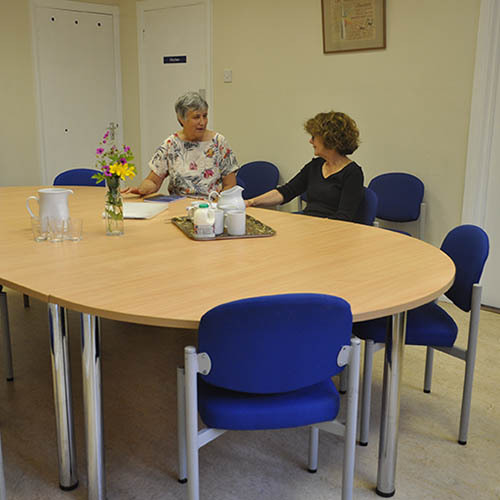 This quiet room has a central oval table, seating up to ten people. There is a kitchenette nearby for making hot drinks. 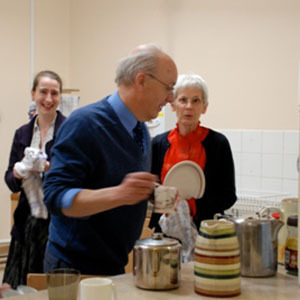 Typical uses include committees, small group tuition and counselling. 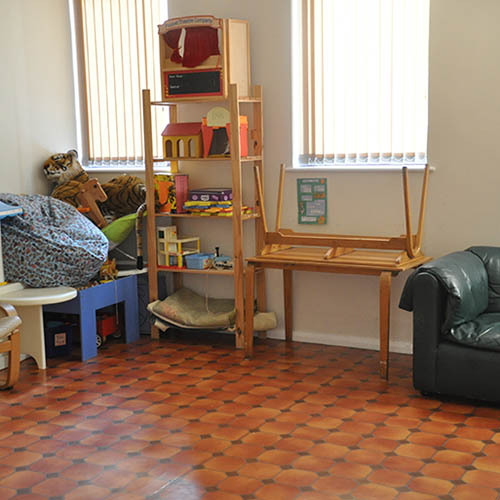 This is a spacious, light room with a sofa and toys. It is suitable for groups with up to 15 children, and also used by adult groups. There is an adjacent kitchenette for making hot drinks. 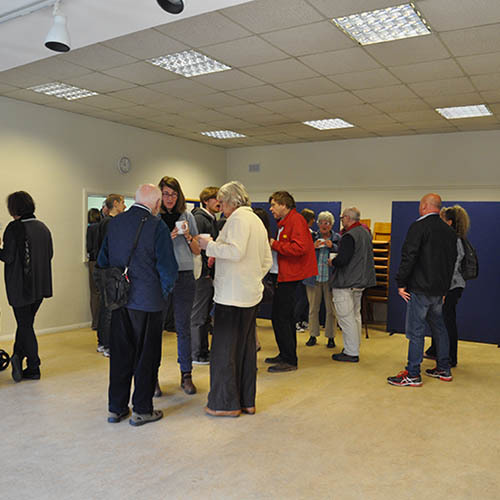 Typical uses include children’s groups, and adult meetings that like a less formal setting. This has a cooker, hot water urn, fridge and double sink, along with cutlery and crockery for 80+ people. It opens off the spacious foyer. There is a serving hatch to Hall. Quiet location within easy reach of Reading’s busy town centre and major rail interchange. Accessible toilet and shower, and baby-changing facilities. Access to our tranquil garden and burial ground. These charges apply from 1 January 2019. More details of rates can be found in the detailed terms and conditions, see Booking details below. Or call 0118 950 7736 to say which rooms you would like to use and when.